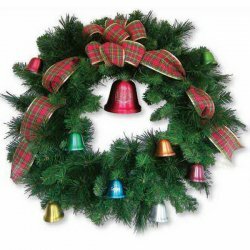 24" Dia Christmas wreath complete with Bow - one 4" large Bell and eight 2" small bells. Price includes the cost to engrave. Large 4" Bell with Family last name and 2" Small Bells - family names, pet names, Company Name etc.